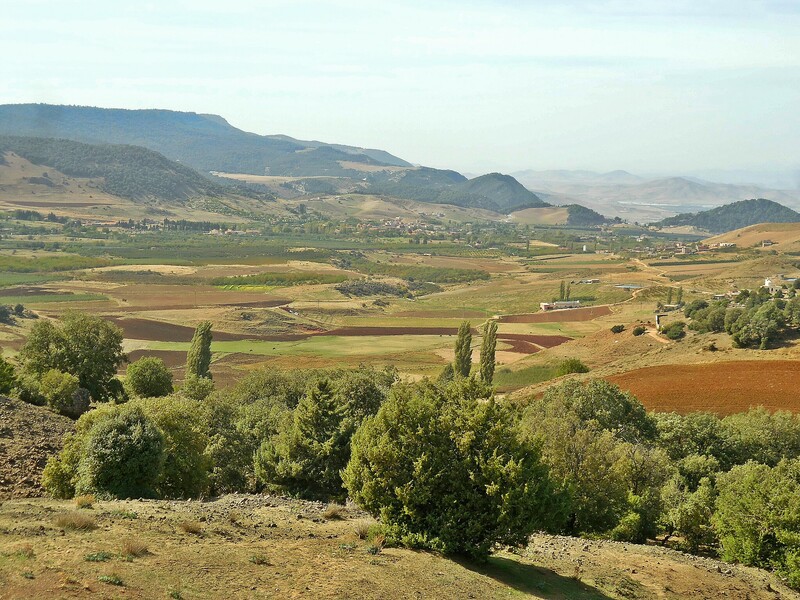 Our drive from Marrakech to Fes provided a good opportunity to observe the changing landscape. 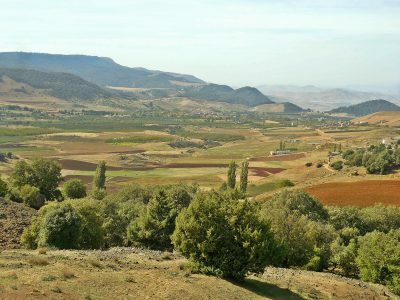 We drove from the desert-like terrain of Marrakech, through rocky scrub, to the fertile area of the Mid Atlas region. Here there are olive groves, fields of crops and grazing sheep. 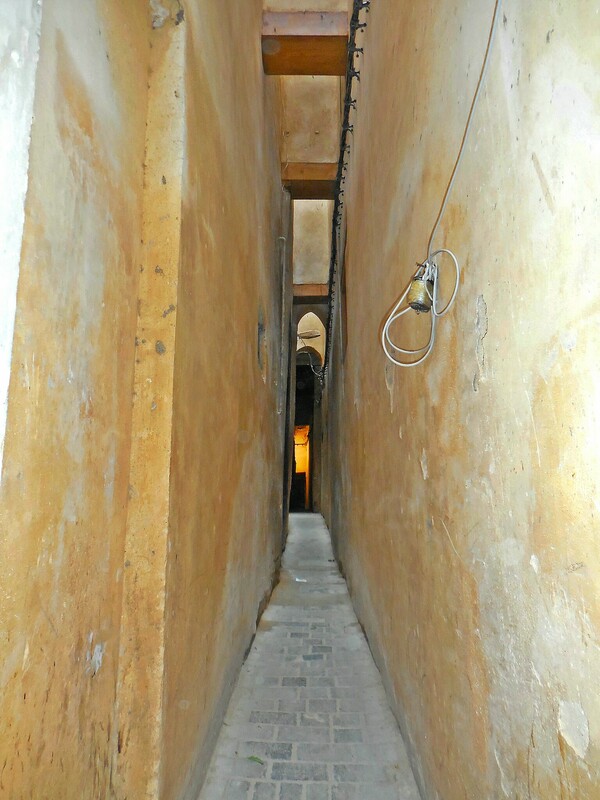 We arrived in Fes and had to walk into the medina to get to our riad, Dar Seffarine, which is situated in the oldest part of the medina. 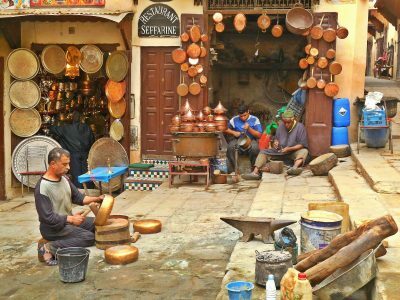 It is next to the Place Seffarine where metal work is done and where all the coppersmiths make their pots and pans. Linden has stayed in this riad many times and knows the owners well so it was a bit like staying with friends since it is small, homely and welcoming. All the guests sit together at a communal table in the garden or on the terrace for meals. 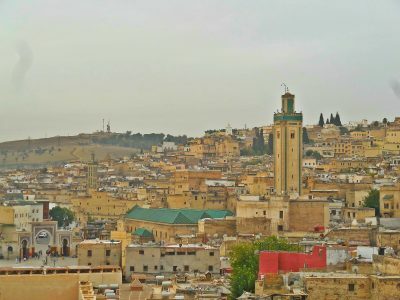 The medina of Fes, reputed to be the largest in the world, is roughly divided into two parts, Fes el-Bali, the oldest, was first established in 789. 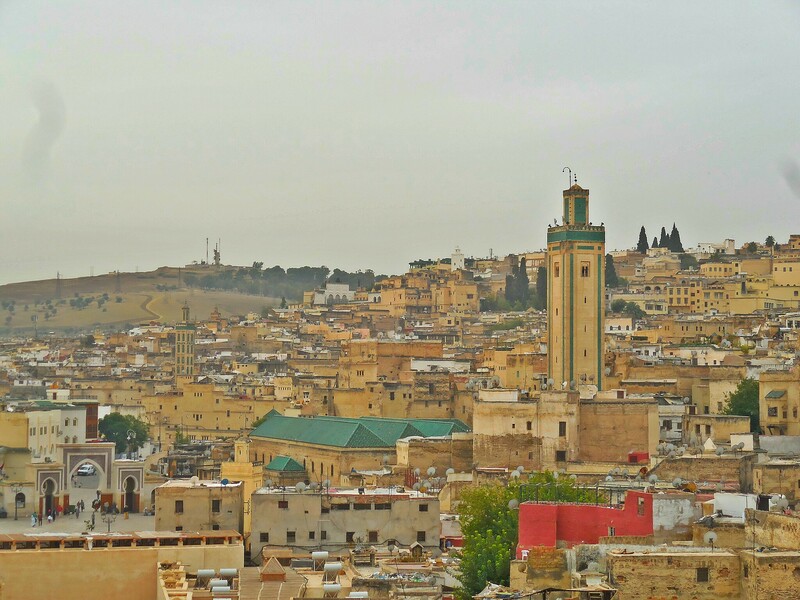 Fes el-Jdid was added about four centuries later and encompasses the Jewish quarter. Outside the walls is Ville Nouvelle which modern and hip with shopping malls and fashionable stores. 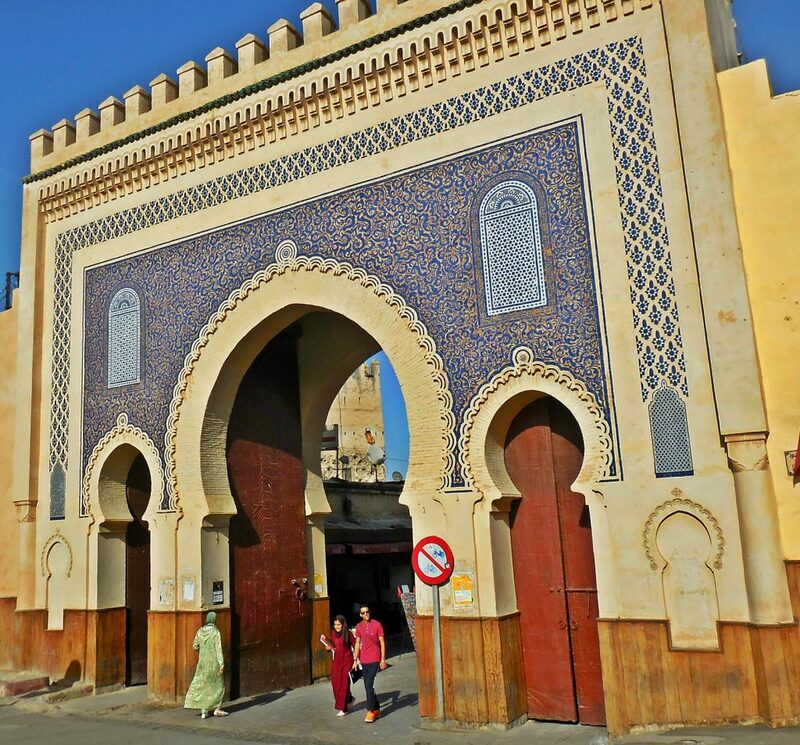 There are 260 mosques in the medina. Its hard to describe the cacophony of sound that fills the air at the calls to prayer held five times a day. Suffice to say that the first time I heard it, the evening we arrived, it sounded as if dozens of braying donkeys as well as a pack of howling wolves had suddenly been let loose. I think the Imams compete with each other to put out the loudest call. I’m glad none of them are likely to be reading this and hearing of themselves described in this way! 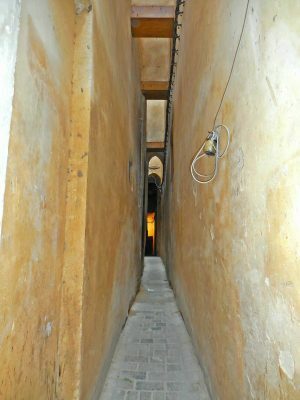 The streets of the medina are very narrow, sometimes narrower than the span of one’s arms, and it is an absolute labyrinth with a maze of streets, many of them dead ends. 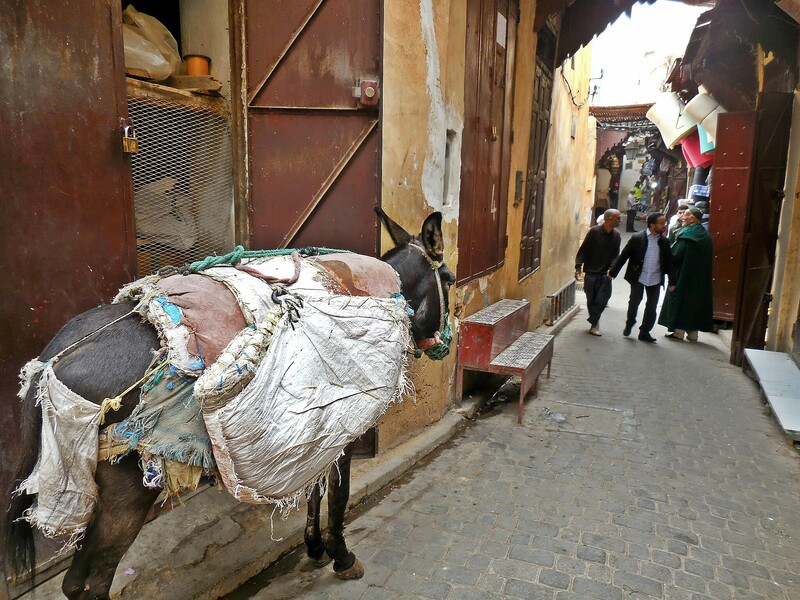 There is no motorized traffic in the medina, not even bicycles and goods are carried by mule. 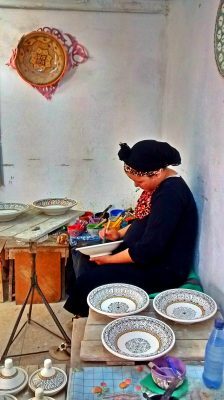 Craftsmen work in clusters in the same way as they might have done hundreds of years ago, with needle and thread, chisels and hammers, paint brushes and other tools used by hand. There is the feeling of having stepped back in time. What I find fascinating is the difference in style of the houses in the Moslem and Jewish quarters. As in Marrakech, Moslem houses have practically windowless walls on the outside. If windows are present, they are like slits. 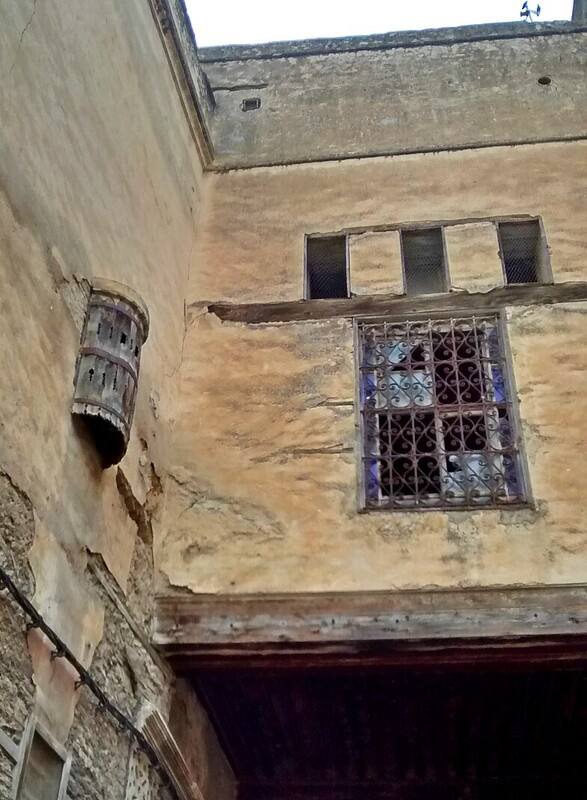 This particular window below, is curved so that women can look out onto the street without being seen from the outside. In the Jewish quarter on the other hand, the houses have windows and balconies and the atmosphere is quite different. 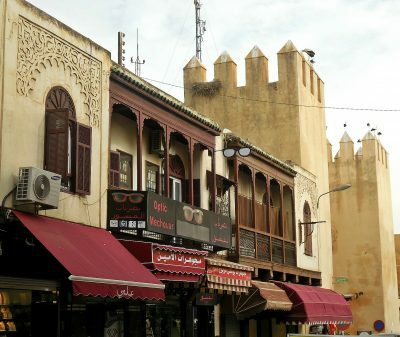 There was a large Jewish population in a number of cities in Morocco until the 1960s when most of the Jews left to go to Israel, France and Canada. 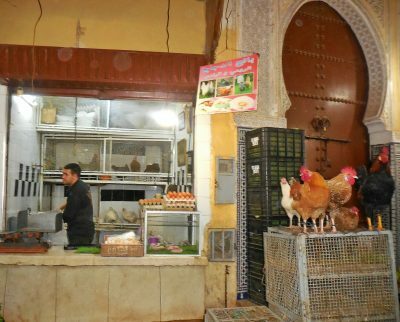 Now, only about 200 Jews still live in Fes. Our cooking experience continued in Fes. We started with a trip to the souk to buy ingredients. We picked a live chicken and while we continued with our shopping, the vendor plucked and cleaned it for us ready to pick up on our way back. 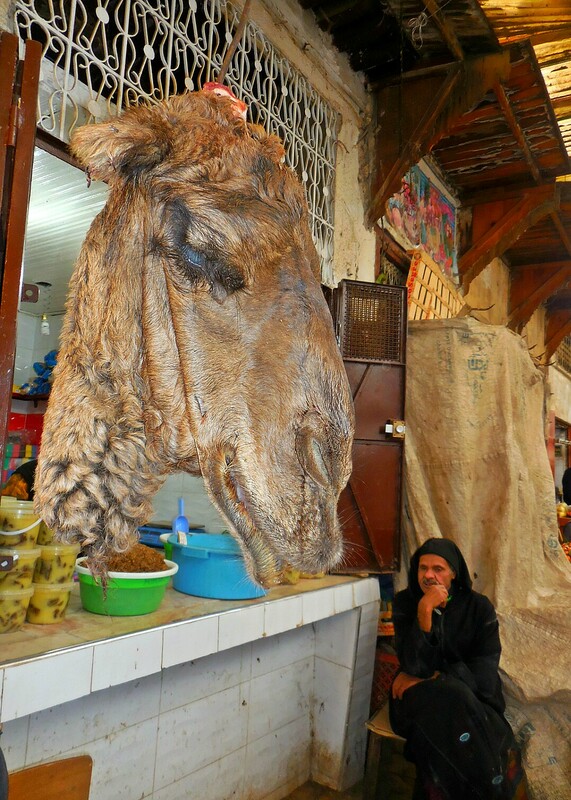 Camel meat is also sold and butchers selling camel meat can be easily identified. I haven’t gotten around to tasting it though there’s a cafe that sells camel burgers and I’m told that the meat is very lean. In our cooking class, we made Pastilla, a pie enclosed in a very fine pastry which is usually bought freshly prepared in the market. Pastillas are traditionally made with pigeon but chicken is more readily available. The base is onion, egg, and crushed almonds with the top sprinkled with sugar and cinnamon. 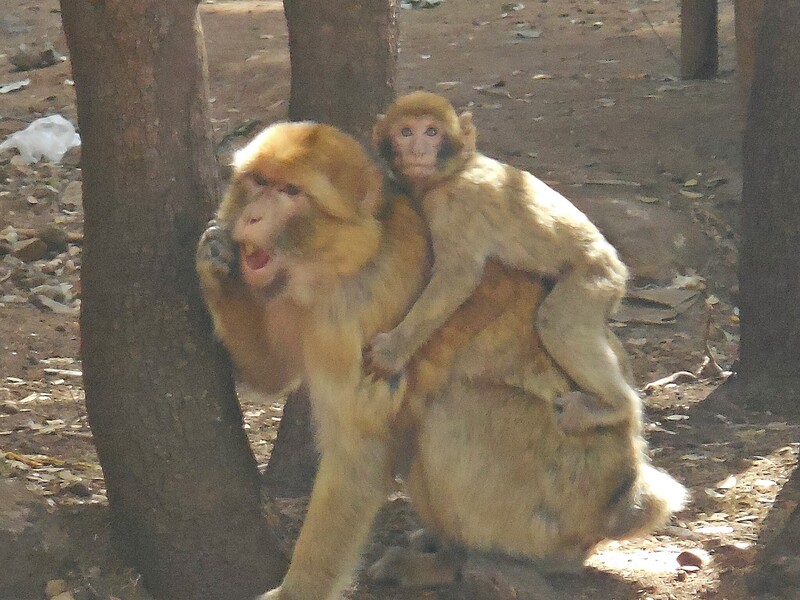 I always think of Loris when I see Pastilla as he was determined to make it once by following a recipe. It took us the whole day and looked nothing like what you see here as neither of us had ever seen or tasted one. He would have enjoyed learning how to do it and what it should really taste like. The day before yesterday, we did a day trip to some small towns of the Mid-Atlas, Azrou, Seffrou and Ifrane driving through ancient cedar forests with Barbary monkeys. 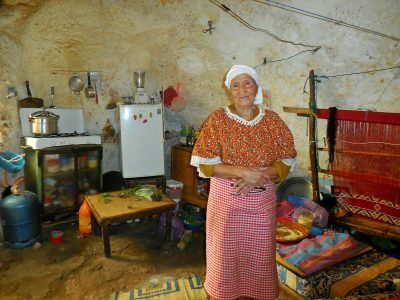 We stopped at a place where a few people still live in houses hollowed out from caves, now hooked up to electricity. This old lady was very welcoming and entertained us to mint tea. She wasn’t at all reluctant or bashful to have her picture taken and of course why would she be since she probably makes her living from tourists giving her money! In Fes you see amazing craftsmanship, beautiful textiles, leatherwork, metalwork etc. 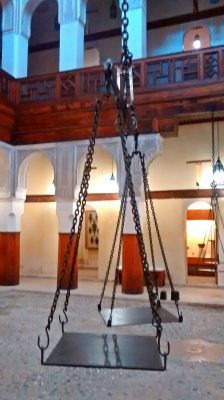 Everyone is looking to make a few dirhams in whatever way they can and bargaining is part of the culture which makes shopping for non-food related items tiring as a whole exchange of conversation has to be undertaken including drinking a glass of mint tea for large items such as carpets. It has always been like this in countries based on trading. 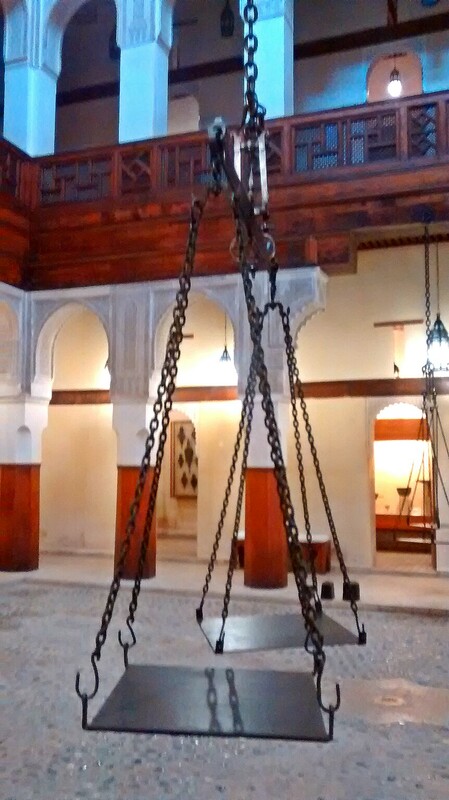 Fes was on the trading route between the Sahara and the Mediterranean and the caravanserais which housed the traders as they went on their way had huge scales for weighing goods for exchange and barter. We have been doing a lot of rushing around but we took it easy today and went to a hammam. First we were taken into a steam room, then we were scrubbed clean on marble tables and given a little massage. Finally, there was a dip in a cold pool to close the pores. It was very pleasant and relaxing and I was glad to have a day of rest as tomorrow we leave for Meknes and Chefchaouen. Such rich, colorful and evocative reporting, Joyce, you are making me jealous! Thanks Niamh. 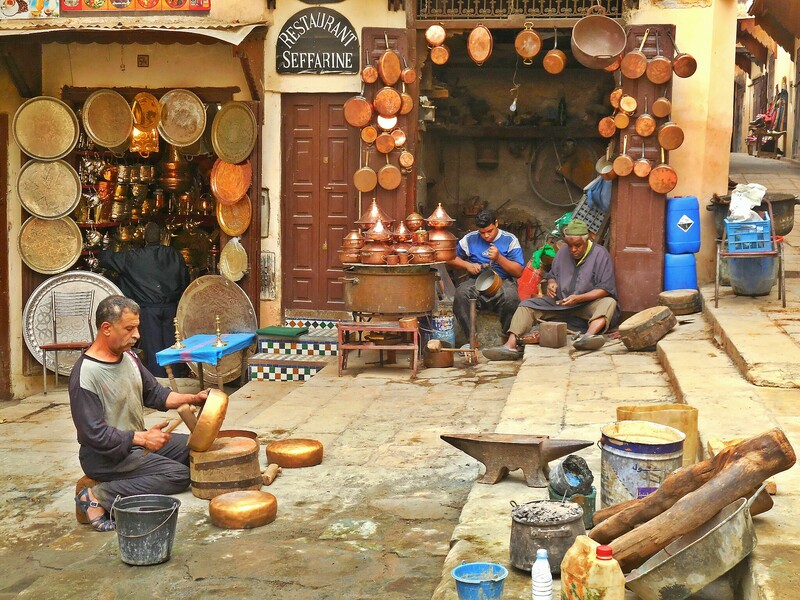 So many facets of Morocco fascinate me. 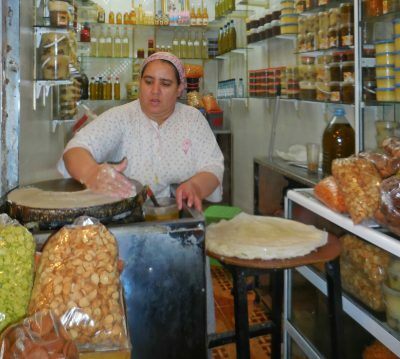 The Moroccan Jewish culture, differences between the Arabs and the Berbers, the role of women. Hard to include it all!